Take A Break From Social Media And Reconnect With Each Other And Nature! Tree lined concrete driveway leads down to the cozy cedar cabin with 3 separate parking pads, enough room for 4 vehicles. Cabin sits very close to the lake which allows for a short walk to the dock. Close enough for house and dock to communicate with each other. Dock sits in a small cove with year round deep water which makes it perfect for swimming off the sunbathing platform without interference from boat traffic. If ski doos are your choice for the lake, there are 2 ski doo ports for docking. Directly behind the cabin is a shaded stamped patio for entertaining or relaxing with clear views across the lake. Lighting on the deck, patio and dock path allows for entertaining at night with a fire pit to keep the chill away or just to make s’mores. 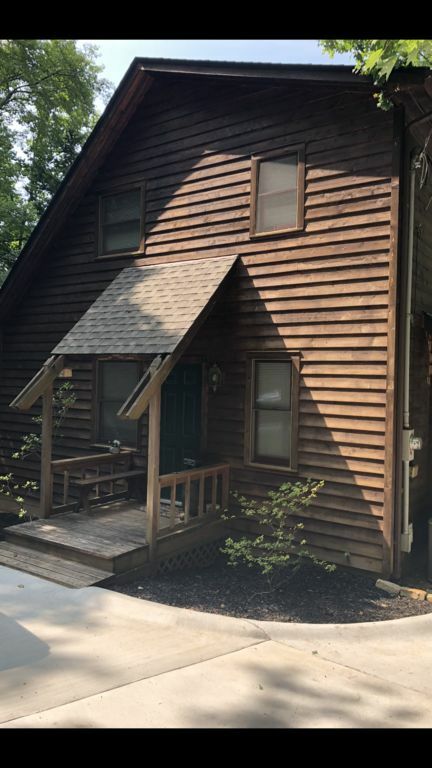 Our cozy cabin has 3 floors: the loft has a beautiful cedar ceiling with two ceiling fans, king size bed, bath with shower, walk-in closet, sitting room with couch that folds down to a full size bed and French doors that lead out to small deck. The main floor has 2 living rooms with a see thru fireplace between, 2 couches that pull out to queen beds, bath with shower. Dining room, kitchen with pantry, stainless steel refrigerator, stove, microwave and dishwasher. Kitchen is stocked with everything you need to prepare and serve your meals. Two large windows and French doors look out on the deck with a great view of the lake. The deck has a large gas grill and bar height table and chairs. The lower level has a bedroom with queen bed, bath with shower, living room with wrap around couch, small refrigerator to keep your drinks cold, table and chairs and twin over full bunk bed. French doors lead out to the stamped patio. Flat screen TV’s in bedrooms and living rooms with a variety of movies for all ages, and board games and decks of cards for a little friendly competition. Take a break from social media and reconnect with each other and nature. The closest marinas to our cabin are Whitman Hollow and Sequoyah. They both are about 10 minutes by boat. You will drive past Whitman Hollow on your way to the cabin. They offer pontoon, speed boats, jet skis and tubes for rent. Free local and long distance in Continental US. 6 on the main level, 4 on the lower level as well as outside dining on the picnic table and a bar height table on the main deck. Flat screen tv’s in living rooms and bedrooms. Blu-ray players in living rooms and bedrooms. Card and board games for a little friendly competition. Several movies available for all ages. What a wonderful retreat! We absolutely loved this cabin and would love to come back in early summer! 5 stars all the way, thank you so much for sharing your home with us! So glad you had a wonderful stay at our cabin and we look forward to your next visit. Beautiful, serene place to stay! Very peaceful place. Would recommend it to anyone! Get off the grid and relax!!!!! Beautiful place! Great place to stay and enjoy Big Creek on Norris Lake. Owner was very pleasant to work with and very prompt to answer any questions we had. The house was very well laid out and did not feel cramped even with the 4 adults and 7 kids that we had in our group. Easy to get to and just a few minute drive to Whitman Hollow which has a boat launch and trailer parking. No wifi in the house but only a couple minute boat ride to norris damn area where you can get lte service on your cell phone if you have to have internet access. Location on the lake is awesome. Big Creek is one of our favorite places to stay. Will definately try to stay here again next year. We stayed for a short 2 day trip over this past weekend with some friends, and this property was very accommodating for our two families. We loved the proximity to the water and being able to keep our boat right on the property was very convenient. We were very close to Whitman Hollow marina. There was plenty of room for all the kids to spread out and the kitchen was fully stocked. We enjoyed the fire pit overlooking the lake immensely. I cannot say enough nice things about the property owner, Linda was extremely accommodating and gives you her personal # to get in touch with her if you absolutely need anything. Would stay again and recommend for those traveling with kids, there were lots of board games and movies available to use as well. Glad to hear you enjoyed your stay and thank you for the great review.